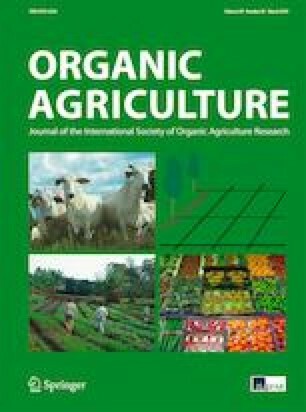 A study was conducted in 2013 to assess opportunities and challenges of integrating dairy cattle into organic pineapple production in Uganda. Thirty organic pineapple farmers were interviewed using a semi-structured questionnaire. The main dairy cattle management systems were tethering (73%) and zero grazing (27%). Average landholding was 1.74 ± 1.06 and 3.75 ± 2.70 ha for zero grazing and tethering systems, respectively. All farms were diversified with various livestock such as cattle, goats, sheep, pigs, and chickens and crops including pineapples, maize, coffee, bananas, beans, sweet potatoes, and cassava. The level of integration of dairy cattle into pineapple production depended on the distance of crop fields from the livestock enterprises. More farms (83%) with pineapple fields closer (< 0.5 km) to the homesteads were able to use cattle manure as fertilizer compared to homesteads (50%) with more distant fields (> 0.5 km). The distance to the homestead did not influence 30% of the farmers who used crop residues for feeding dairy cattle. Farmers perceived cattle diseases and feed scarcity to be the major challenges in dairy farming. The sources of risk on the farms were perceived to be erratic rainfall, limited knowledge, and market for organic products. Majority of farmers (77%) expressed willingness to convert to organic dairy production. Availability of markets for organic dairy products (36%) and reduction of external input use (26%) were the main reasons for farmers’ willingness to convert. Integrating dairy cattle with pineapple production is an opportunity for closed nutrient cycles and income diversification. However, knowledge, access to inputs, and organized markets are needed as incentive for conversion to organic dairy production. The study received support from the Danish Agency for International Development (DANIDA) for sponsoring the research through the Productivity and Growth in Organic Value Chains (ProGrOV) project. The manuscript does not contain clinical data studies or patient.